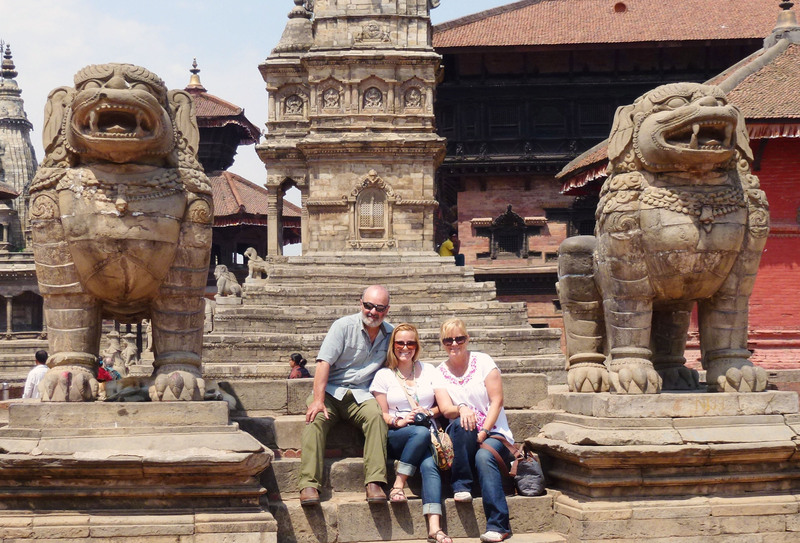 Our trip to Nepal is one that will stay with us for the rest of our lives. Though we tried, our words and pictures do not do it justice. However, I am thankful for them because I know that for years to come, we will be able to relive this adventure through these stories we have shared. And we hope that you too have gained something through them. We want to thank everyone for taking this journey with us, sharing with us in the tears and the laughter that we experienced along the way. It was a difficult road, in many ways, but it was made easier by the support and encouragement of our loved ones at home. I want to thank my mom and dad for letting me tag along, always having to request a roll-away in the hotel room and squeeze in a little closer in the tiny taxis. I am so grateful I was able to share these experiences with them. And finally, we would like to thank the people of Nepal, without whom these stories would not have their characters, their humor, their sadness and their reality. We were truly touched by the warmth and kindness of the Nepali people, and we hope to imbue in others their principles in life. 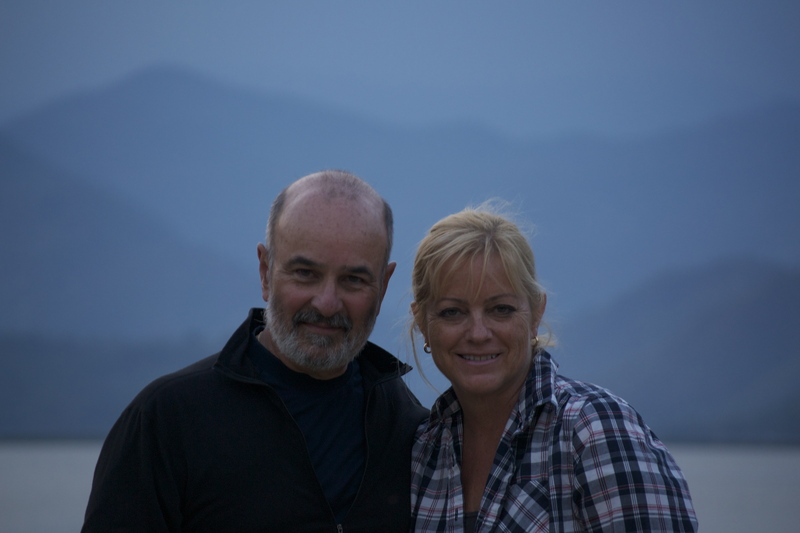 We arrived back in Los Angeles a few weeks ago, but our time in Nepal has stuck with us more than we could have imagined. When I set out on this journey, I was hoping to add a few details to my Master’s thesis, but what I found was that as much as I tried, I could not escape the hold that the country had on me. Though it is difficult to express all the things I have learned from my journey, I have had some time to reflect, and have compiled a list of things I learned. Learn to squat. While most restaurants in the big cities have “Western toilets,” asking for one promises to get you strange looks. There is always room. There is a great movie in theaters right now, “The Best Exotic Marigold Hotel,” which takes place in India. 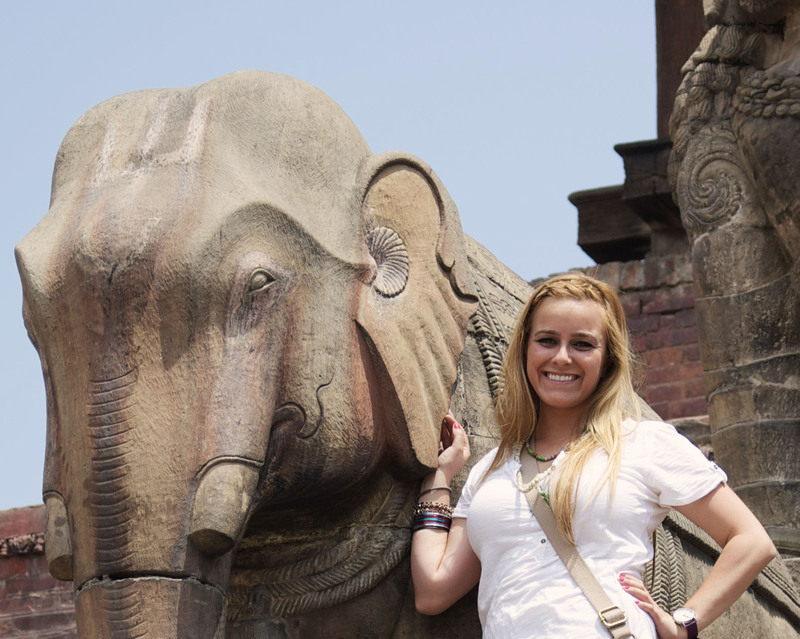 However, almost everything about it can be applied to my experiences in Nepal. 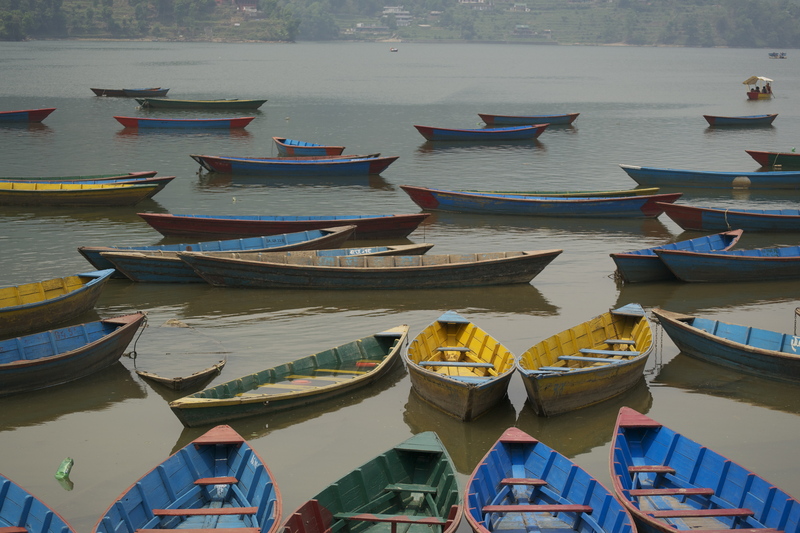 As one character says while trying to squeeze into a bus full of people, “There is always room.” This can be said about most things in Nepal—the busses, extra guests at a local’s home, even your belly when your host fills your plate with daal bhat for the third time. Don’t eat that—but don’t be afraid to try the local food either. 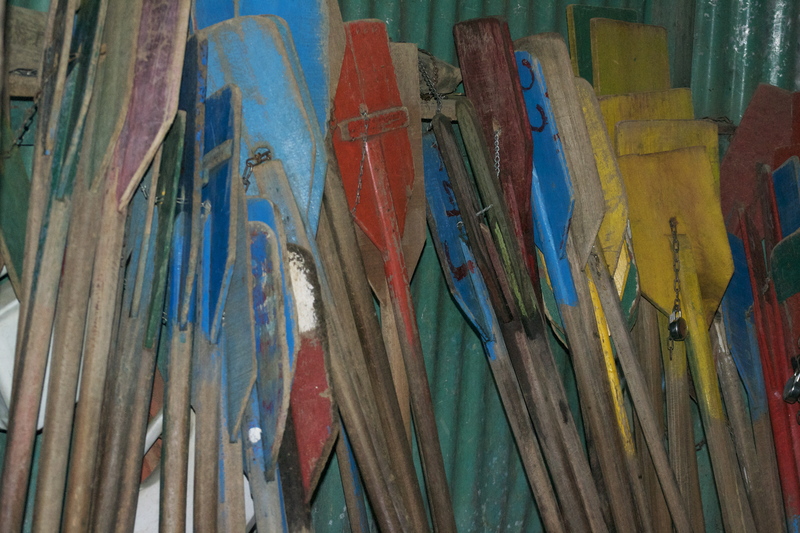 Every single person we met (tourists, trekkers, aid workers) spent at least an entire day sick. Somehow, none of us did. We were very careful about we ate, making sure that everything was cooked before we tried it. 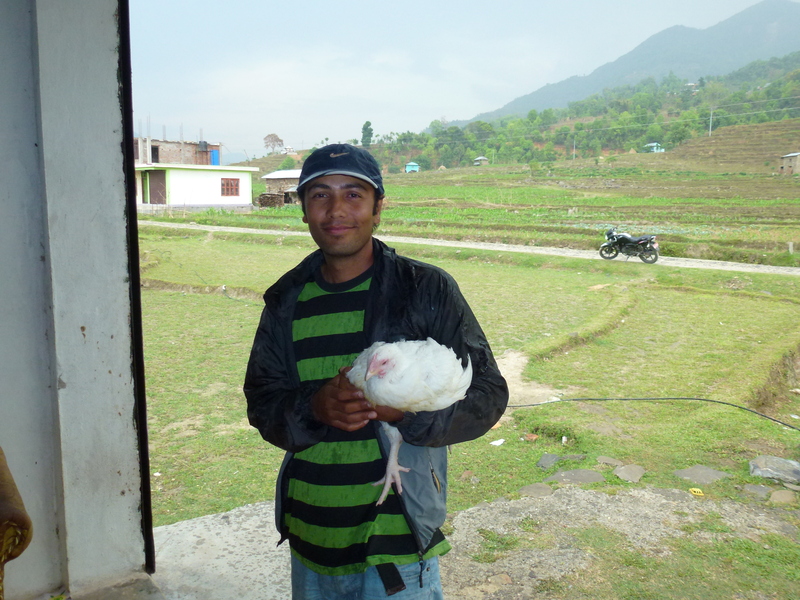 Thankfully, most Nepali food is cooked, and the tea is boiled. But after a week of filling ourselves with rice and lentils, we had to force ourselves not to order salads. 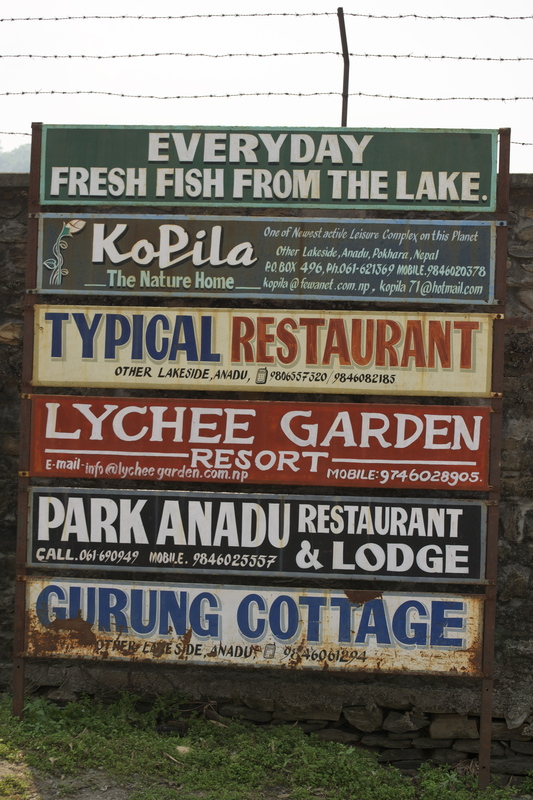 With that in mind, is would be an injustice to travel to Nepal and deprive yourself of the Nepali cuisine. Even after we came home I still craved momos, a Nepali-style dumpling, and Chicken Sekuwa, grilled spicy meat. Look up! Yes, you will step on spit and cow dung, that part is almost inescapable. But fussing over and side-stepping an on-coming luggie will only make you miss the beautiful scenery. Even in the streets of Kathmandu where the mountains aren’t visible above the colorful handing garlands, the bright marigold wreaths and beads around brown necks are only the surface of the onslaught of the attack on your senses. At every turn, a new sight, smell, feeling awaits. Don’t refuse an invitation. If someone offers you tea, accept. We must have insulted many people trying to rush off to make the bus get to a meeting on time. Bring an umbrella. I finally understand why people carry umbrellas when its not raining. The temperatures got up to 100 degrees with little shade or wind for relief. Almost every day we wished had brought an umbrella with us. Watch out for others’ umbrellas. It seems that on the crowded streets of Kathmandu, you are more likely to be poked in the eye by an umbrella than mugged like most tourists in other cities. Old dogs can learn new tricks. 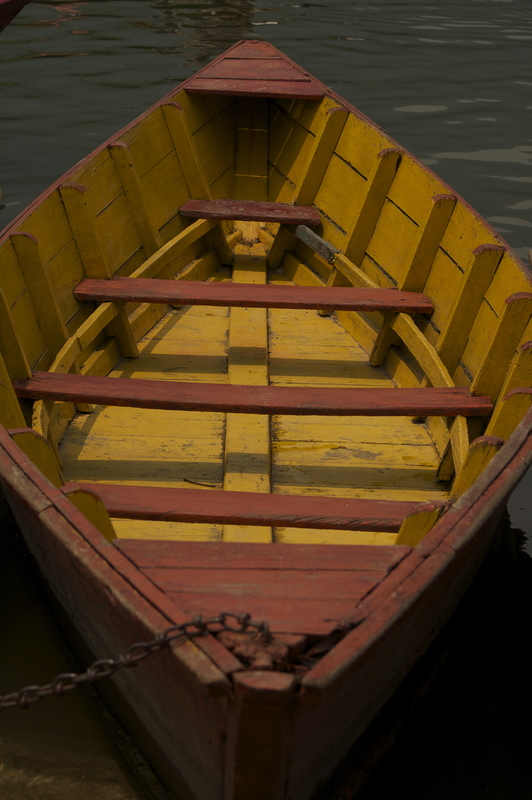 (Thank you Marigold Hotel, again) Three weeks in Nepal taught me that most of the Western comforts I took for granted weren’t actually a necessity and our habits were born out of complacency and were ready to be shaken. We got used to brushing our teeth using our sterilized water. When we first arrived in Kathmandu, just crossing the street without crossing signals seemed a sure death wish. We followed closely behind the locals, as my mom screamed at my dad for almost getting us run over. After just a few days though, we learned to navigate the busy streets on our own with just a few Nepali words shouted at us that we were probably better off not understanding. The world is big, the world is small. When I was little, there were two places in the world that I considered to be the most different, exotic and unlike anything in my own world: Kathmandu and Timbuktu. The names just oozed adventure. Never did I expect to actually visit one of these places. And being there exceeded every expectation that I had accumulated in preparation. It is a world different from my own in every way imaginable. And yet, at its root, it is exactly the same. It is fitting that we ended our trip to Nepal with a visit to the holy crematorium at Pashupatinath. On the banks of the holiest of holies, the Bagmati River, Pashupatinath represents the place of endings and beginnings to the Nepali. It was there that we were forced to think deeply about life. Its beginning, its end, and its purpose. 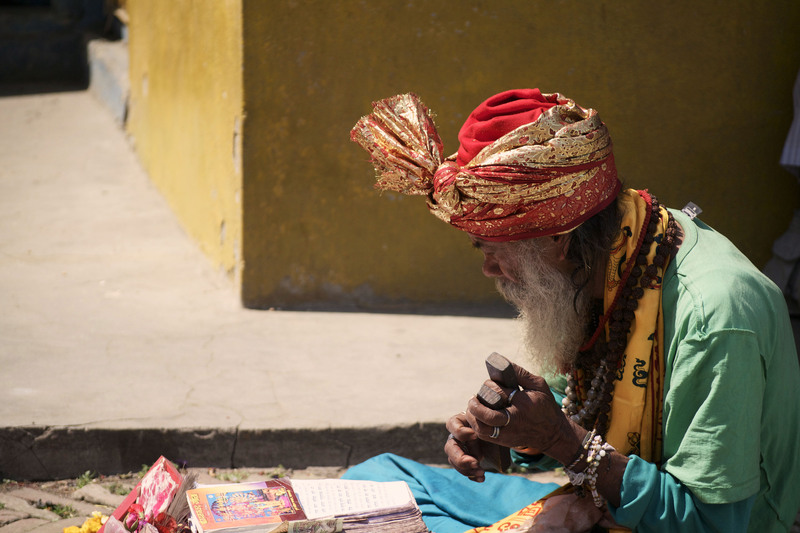 At first, to our Western sensitivities, Pashupatinath makes you hold your nose and avert your eyes. The spectacle, the odors, the emotions of mass cremations is very difficult to accept. Yet, as with life, you learn to ponder deeper meanings. 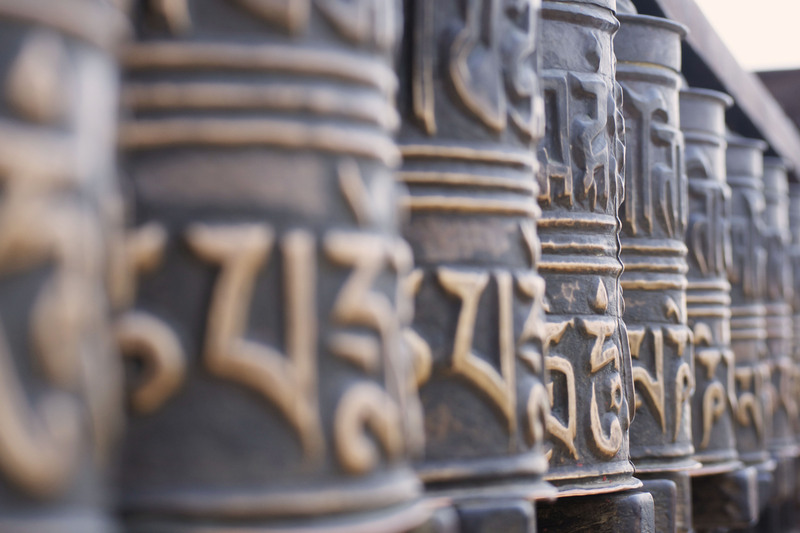 The end merging into the beginning – the transitory emerging from the permanent. The ceremony is most delicate. The body is prepared, purified, presented, cremated, and then offered to the river. The family members gather not only to attend the ceremony, but also to become participants in the act. They wait—thinking, chatting & discussing the deceased’s life while they watch the body burn. The sight of the flames, the smell of the ash, the heat of the fire, the taste of the rice and the sound of the mantras all become part of the family’s substance. 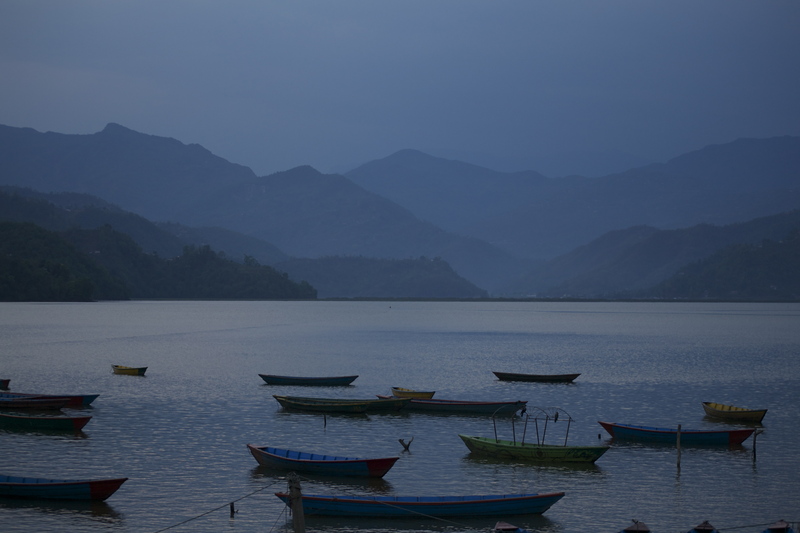 As the ashes settle on the banks of the Bagmati and return to the earth, the four elements of life are recreated: the Earth that collects the ashes, the Wind that carries the smoke, the Fire that purifies the flesh, and the Waters of the Bagmati. Life is renewed. Transient, yet immutable. Note: Please be warned that some of the following images are a little graphic. 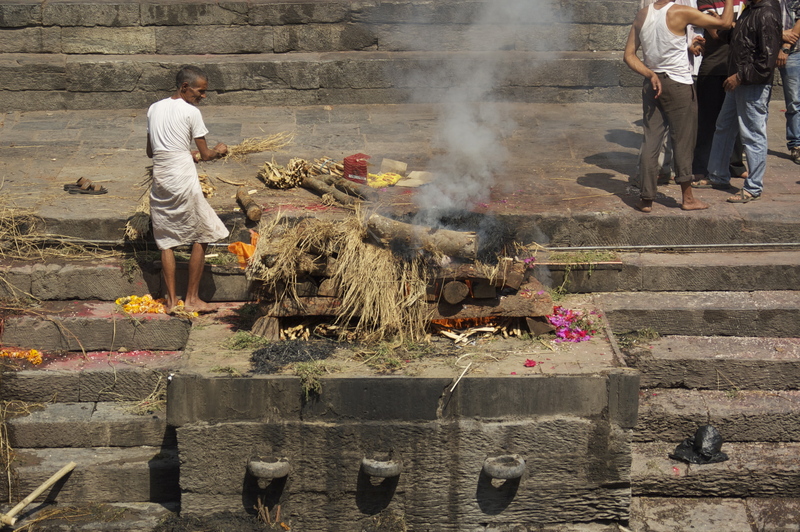 I have decided to post pictures of the cremation ceremonies because it is what this sacred place is about. It was a beautiful and moving experience for us, and while it might be shocking to many readers from Western cultures (as it was to us at first), that is a large part of why it affected us so much. I am fortunate to have travelled quite a bit in my life. I have napped on beautiful white sand beaches, navigated through the back streets of Europe, seen the ruins of Machu Picchu, drifted along the Amazon. I have seen the Andes, the Alps, the Rockies. But none of these compares to the Himalayas. 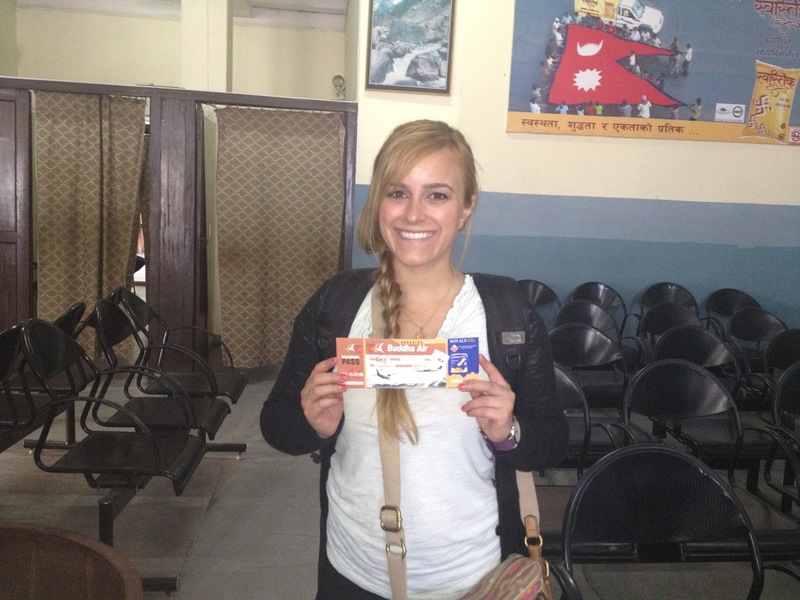 We took a short 25-minute flight from Pokhara to Kathmandu, flying along the mountain range. The Pokhara airport is tiny, and the metal detector in the “security” section was broken. The flight announcement we were told would be made was actually just a man running around telling passengers it was time to go through security. While waiting for our flight, we saw a small Buddha Air plane take off. We were told that was our plane. The small propeller plane made its way to Kathmandu and back in one hour, getting us in the air just in time to see the Himalayas peaking its white tips high into the sky. The two curtains behind me block off the security rooms at the airport. There are no x-ray machines and the metal detectors weren’t working, so the men and women were taken into the separate rooms for a pat down. 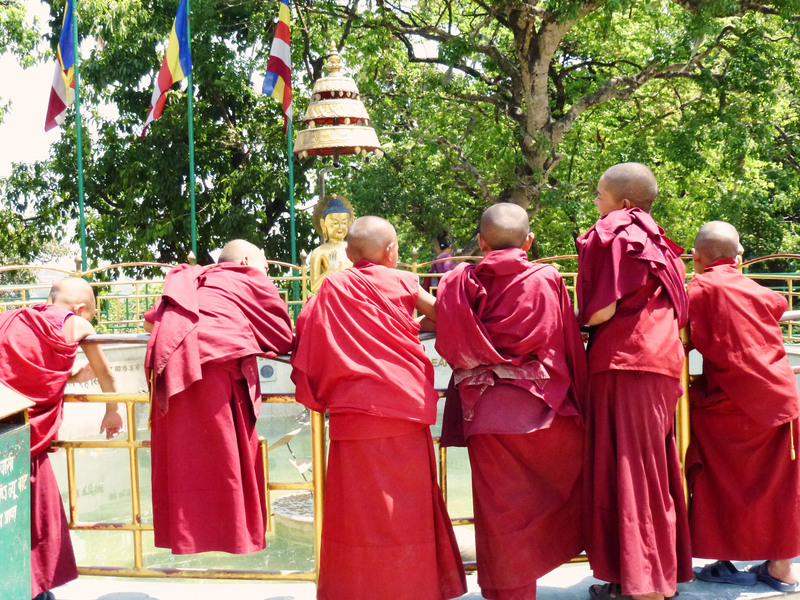 After we landed in Kathmandu, someone pointed to small figures running across the runway. 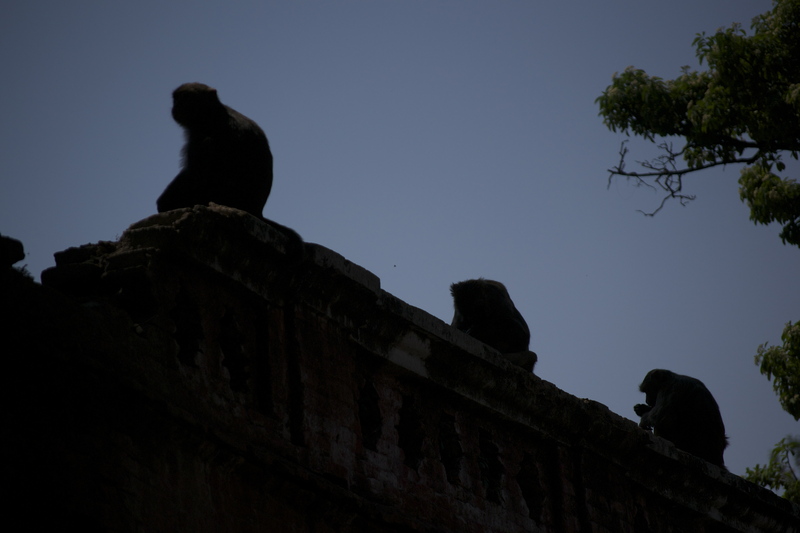 I turned and saw dozens of monkeys running from one end to the other and over a high fence into the trees. I shouldn’t have been so surprised to see them. 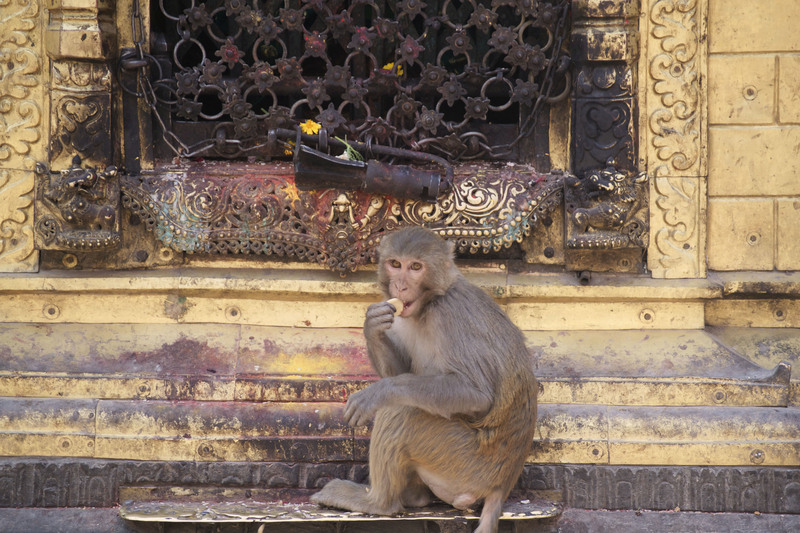 Animals run free all over Nepal. In fact, Chitwan, in Southern Nepal, has a large National Park that houses Bengal tigers, leopards, pythons and the second largest population of Asian Rhinoceros. In Kathmandu, large cows with fresh marigold wreaths around their necks sleep unharmed like center dividers in the busy streets. But for some reason, the monkeys on the runway completely caught me off guard. 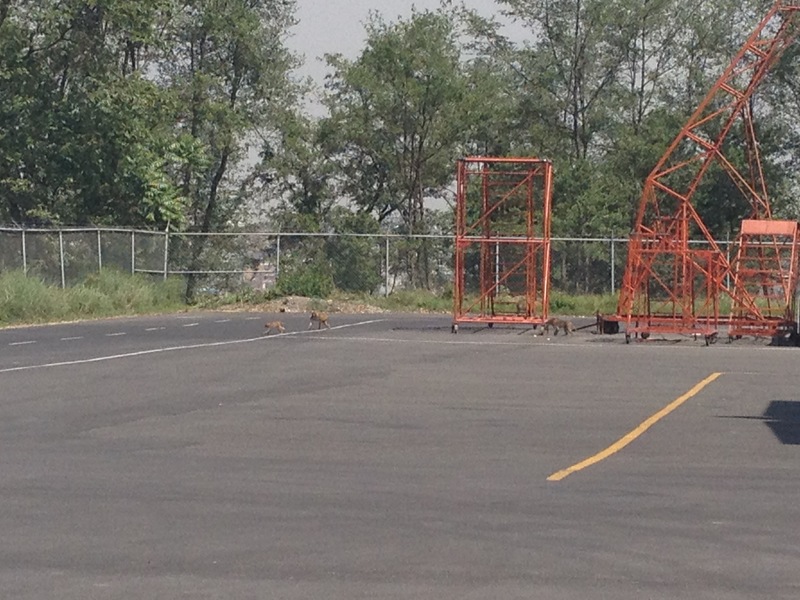 Dozens of monkeys ran across the runway and climbed over the fence. 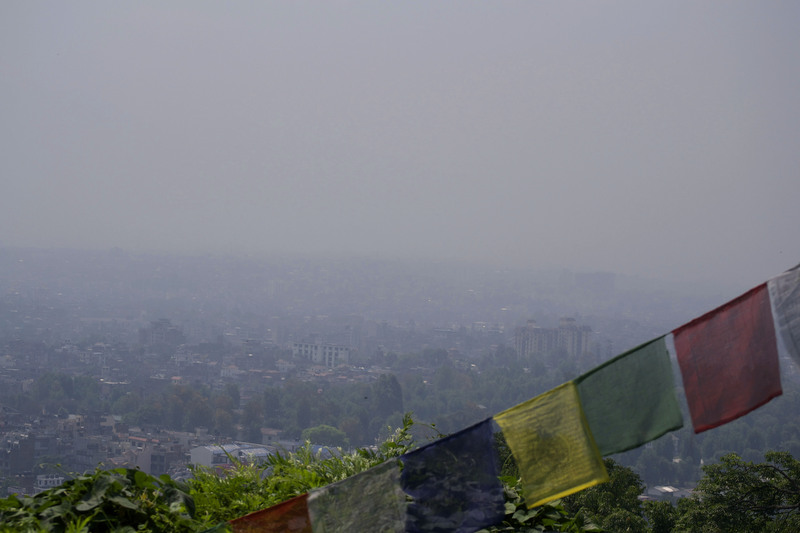 We arrived back in Kathmandu around noon, and seeing the drive to the hotel in the daylight gave me a completely different perspective of the city. Our first time there, it was pitch black when we arrived, and my mom joked that it was a good thing I couldn’t see where we were going. This time, I saw the back alleys, the rubble on the side of the road, the pothole-ridden street that led to our hotel. I was thankful that I had already seen Kathmandu in the daylight, because if this were my first impression, I would have asked the driver to turn around. 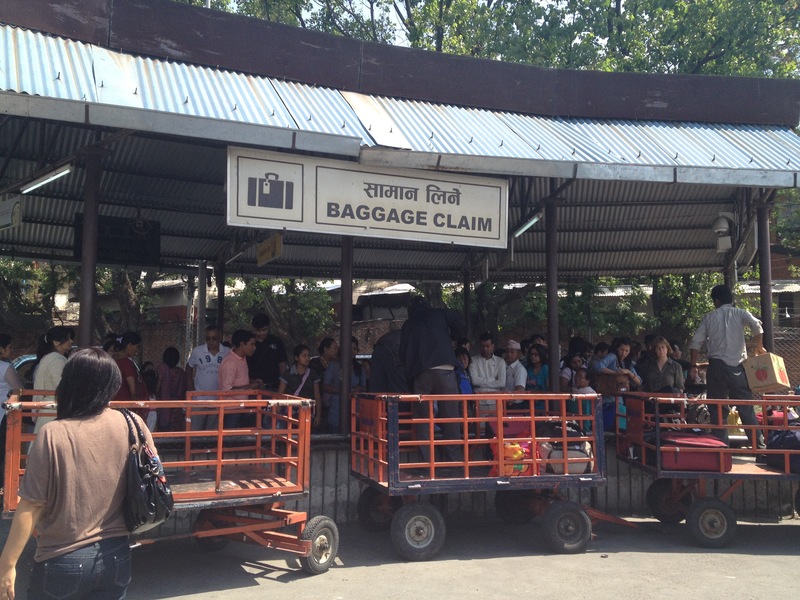 The Kathmandu baggage claim. The men stand on the carts waving the luggage until someone claims it. As it usually happens when you’re on vacation, the second half of our week in the valley went by too fast. On the morning we left, I remembered back to the first few days when I annoyingly asked my parents why in the world we needed to be here for one whole week. I told myself that if I could make it until Tuesday, half way, the rest would be easy. I was right. As the days went by, I got used to seeing everyone eat with the their hands. I got pretty good at squatting to go to the bathroom. And we learned what to do during a standoff with the buffalo (which happened more than you might think). I really enjoyed my last few days there, and cursed the close-mindedness I once had. Our Farewell Ceremony was even grander than our Welcoming Ceremony. My dad was presented with a “topi,” a Nepali-style hat that the respected men of the community wear. My mom and I received beautiful Nepali cloths to be worn as shawls. We were thanked for our visit and for our contributions to the village. We were called things like “honorable” and “distinguished”—descriptions that certainly don’t fit us. That is how the Nepali people speak. Every white person is “a wonderful personality.” But we couldn’t help feeling unworthy of all of the hoopla. We tried as best as we could to explain that they had touched us as much as we touched them. My dad, mom and me following the Farewell Ceremony. My dad also received a “mala,” the gorgeous wreath around his neck. Saying goodbye to Shailee and the children (Jenisa, their 4 year daughter, and Babu, which means “little boy,” their 2 year old son), was much more emotional than we had expected. For the last week, they shared their food with us and shared their lives with us. 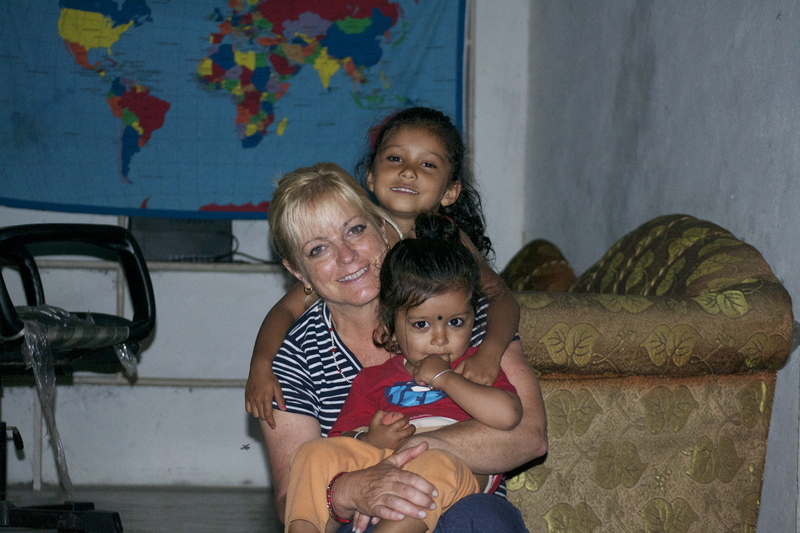 These two children touched us immensely, with their beautiful smiles and infectious laughter. When I hugged Shailee, I saw tears in her eyes and all the efforts I had made to suppress mine were futile. Nabaraj and Jenisa accompanied us to Pokhara, our next stop, because Jenisa goes to school in Pokhara where her grandparents live. She sat in the backseat with my mom, dad and me during the long car ride, and fell asleep spread across our laps. We were all secretly happy that we didn’t have to say goodbye to her until the next morning. 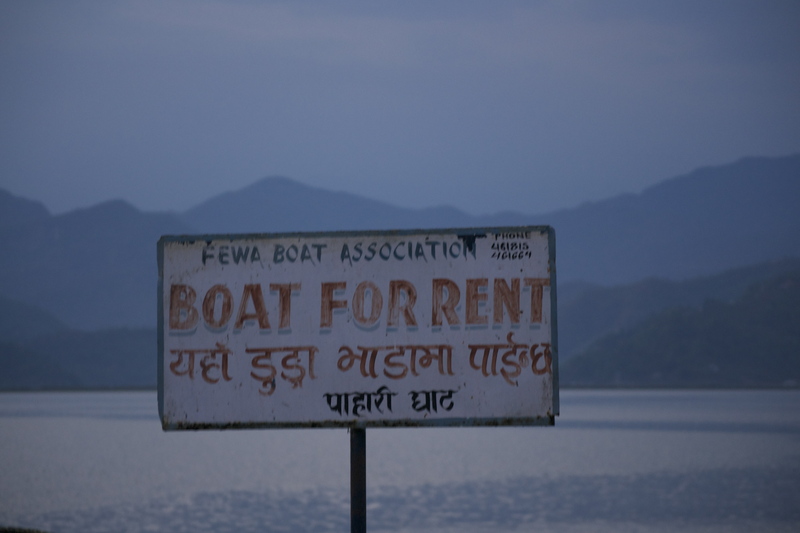 The ride to Pokhara was similar to our ride out to the valley from Kathmandu, except for one strange occurrence. We took a “jeep,” which is really just an old pickup truck, and when we arrived at the river to cross, the driver stopped and asked us to get out. This was the car wash. We stood to the side for 30 minutes as he splashed water into the bed and behind the wheels. Sure enough, the truck was clean. As we drove into Pokhara, the streets were packed with people dressed head-to-toe in red, and busses drove past us with red flags. There was a Communist Convention. The Maoists took control of the government a few years ago, and were gaining support from the impoverished Nepali people. These conventions happen every once in while to ensure that their commitment doesn’t waiver. Throughout the city, hammer and sickle signs were abundant. This must have been the first time I had seen such outward support of Communism, and I was scared. The Princess. Photo taken by my dad.